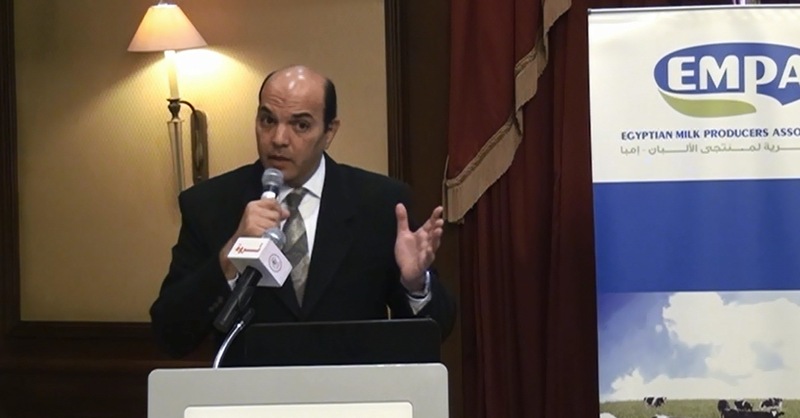 The Egyptian Milk Producers Association - EMPA hold a scientific seminar on Saturday, 12.19.2015 JW Marriott Hotel - Mirage City - Ring Road - building Castel Club House, promptly at nine am until four pm. About Feeding livestock, Farm Management and Reproduction. The presence of the Board of Administration and a large number of the members of the Assembly, experts and consultants. 1. Lecture on farm management by Dr / Mohammed Waarer and managing director of the farms we have. 2. Lecture feeding dairy cattle and by Prof. / Mohamed Hegazy agent Reproduction Animal Research Institute. 3. Lecture Reproduction by Prof. / Mahmoud Hussein, a professor of obstetrics and reproduction and agent Faculty of Veterinary Medicine University of Beni Suef. - Prof. Dr. / Ibrahim Gad, director of the Institute of Animal Reproduction. - Prof. Dr. / Hani Hassan agent animal Reproduction Institute. - Prof. Dr. / Essam Amin agent serums and vaccines Veterinary Institute. - Prof. / Najla Radwan Director General of the Department of Preventive Medicine on behalf of Dr. / Ibrahim guarded chief of veterinary services.